As the only black student at a newly integrated high school, Mike Espy learned firsthand how to navigate the strict racial division between blacks and whites in his home state of Mississippi. This ability won him a seat in the U.S. House of Representatives—the first held by a black Mississippian in more than 100 years—in his first bid for elective office in 1986. “Service, service, service” was the way Espy described his legislative strategy; he focused on economic development and procuring aid for farmers in his impoverished rural district.1 His centrist approach to politics won over constituents of both races and eventually earned him a top position in the Cabinet of his friend President William J. (Bill) Clinton. Alphonso Michael (Mike) Espy was born in Yazoo City, Mississippi, on November 30, 1953. He and his twin, Althea Michelle, were the youngest of Henry and Willie Jean (Huddelston) Espy’s seven children. Though Yazoo City was located in an impoverished section of the Mississippi River Delta, the Espy family was affluent. Educated (along with his wife) at Alabama’s Tuskegee Institute, Henry Espy served as a county agent for the U.S. Department of Agriculture in the 1930s.2 He later joined his father–in–law’s family–owned funeral home business. Mike Espy’s maternal grandfather, T. J. Huddleston, Sr., founded a chain of nursing homes and built the first black hospital in Mississippi in 1921. Huddleston, who died in the 1950s, was a local celebrity and one of the wealthiest black men in the South.3 The prosperous family business initially sheltered the Espy children from segregated public schools. Mike Espy attended a local parochial school through his first two years of high school. After the school closed, in 1969, he transferred to Yazoo City High School. Espy was the only black student, and he carried a stick to fend off racist attacks from fellow students.4 “Relative to the civil rights experiences of snarling dogs and whips and things it was pretty tame,” Espy recalled of his schooldays. “But I’d always have a fight. The teacher would leave the room, and then you’re among 35 in the classroom and they’d make racial jeers.”5 A year later, in 1970, Yazoo City High School was fully integrated, and Espy was elected president of the black student body in his senior year. (The white students had their own president.) Espy went on to earn a B.A. in political science from Howard University in Washington, DC, in 1975. He earned a J.D. from Santa Clara University Law School, near San Jose, California, in 1978, and then returned to Mississippi to practice law. He married Sheila Bell and the couple had two children, Jamilia and Michael, before divorcing. Espy began his political career working in several state government positions. He served as the first black assistant secretary of state, managing the Mississippi central legal services division from 1978 to 1980. For the next four years, Espy served as assistant secretary of state for the public lands division, in charge of enforcing a state law that set aside one of every 36 square miles for educational purposes. 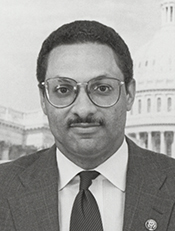 From 1984 to 1985, Espy was assistant state attorney general for the consumer protection division. Espy also drew national attention within the Democratic Party when he served on the rules committee for the 1984 national convention. Following the 1980 Census—nearly 100 years after the last black Representative to serve Mississippi (John Roy Lynch) departed the House in 1883—a statewide redistricting effort created a majority–black congressional district that stretched along the Mississippi River on the western side of the state and encompassed the cities of Vicksburg and Greenville. In 1984, black state legislator Robert Clark came close to unseating white freshman Republican incumbent Webb Franklin in a racially charged campaign. In 1986, the U.S. Justice Department supervised the redrawing of district lines to include more black voters in response to the 1965 Voting Rights Act, which called for higher black percentages in single districts.6 The new Mississippi district, with its slight black majority, was the most impoverished in the country; 42 percent of its residents lived below the national poverty line and five counties had an unemployment rate of at least 20 percent.7 Studying the 1984 election, Espy believed he could improve on Clark’s campaign.8 Narrowly avoiding a runoff election, Espy won a 50 percent plurality in the Democratic primary against runner–up Paul B. Johnson, a grandson of a former Mississippi governor, and Hiram Eastland, a cousin of the late segregationist U.S. Senator James Eastland. As one of the first Democratic lawmakers to endorse Clinton’s 1992 candidacy for President, Espy benefited from his election to the presidency. Having won a fourth term in Congress, Espy sought a promotion to chair an Agriculture subcommittee or a seat on the prestigious Appropriations Committee. Receiving neither, Espy reportedly sent the President–elect a memo with the top 10 reasons he should head the U.S. Department of Agriculture (USDA).30 Clinton offered him the post, and Espy resigned from Congress on January 22, 1993, to begin his new position. 1Robin Toner, “Real–Life Politics in Deep South,” 30 March 1989, New York Times: B7. 2“Mike Espy,” Contemporary Black Biography Volume 6 (Detroit, MI: Gale Research Inc., 1994) (hereinafter referred to as CBB). 3Carla Hall, “Espy’s Mississippi Milestone,” 19 December 1986, Washington Post: C1. 4“Espy, Mike,” Current Biography, 1993 (New York: H. W. Wilson Company, 1993): 184. 6Kenneth Martis, The Historical Atlas of Political Parties in the United States Congress: 1789–1989 (New York: Macmillan, 1989): 235–239; Almanac of American Politics, 1988 (Washington, DC: National Journal Inc., 1987): 655. 7Current Biography, 1993: 185; James R. Dickerson, “House Rivals Tread Fine Line in Race–Conscious Mississippi,” 29 October 1986, Washington Post: A1. 10See Hall, “Espy’s Mississippi Milestone” for a summary of racial divisions in Espy’s Mississippi district. 13Quoted in “Mike Espy,” CBB. 14Dickerson, “House Rivals Tread Fine Line in Race–Conscious Mississippi”; Marshall Ingwerson, “In Deepest of Deep South, Black Lawmaker Wins Many Whites,” 21 October 1988, Christian Science Monitor: NL7. 18Marshall Ingwerson, “Espy’s Mississippi Victory,” 22 December 1986, Christian Science Monitor: 1. 20Bruce A. Ragsdale and Joel D. Treese, Black Americans in Congress, 1870–1989 (Washington, DC: Government Printing Office, 1990): 50. 22“Election Statistics, 1920 to Present,” available at http://clerk.house.gov/member_info/election.aspx. 24Helen Dewar, “For Impoverished Mississippi River Delta, Change Is in the Air,” 17 April 1988, Washington Post: A3. 31“The Dizzying Fall of Mike Espy,” 5 October 1994, Chicago Tribune: 20. Espy was indicted on felony bribery and fraud charges when it was discovered that various food companies had paid his way to sporting events and awarded his girlfriend a scholarship. Also, Espy drove a car leased with government funds on non–work–related visits to Mississippi. He was acquitted in 1998. See, for example, Bill Miller, “Espy Acquitted in Gifts Case,” 3 December 1998, Washington Post: A1. 32Lori Michelle Muha, “Mike Espy,” in Jessie Carney Smith, ed., Notable Black American Men (Farmington Hills, MI: Gale Research, Inc., 1999): 380. Papers: ca. 1987-1994, 100 cubic feet. The collection includes papers, publications, photographs, and memorabilia documenting Mike Espy's tenure on the following House committees: Agriculture, Budget, and Select Committee on Hunger. The collection is closed pending processing. Videocassettes: 1986-1988, 19 commercials on 4 videocassettes. The commercials used during Mike Espy's campaigns for the 1986 and 1988 U.S. congressional elections in District 2 of Mississippi, Democratic Party. "Alphonso Michael (Mike) Espy" in Black Americans in Congress, 1870-2007. Prepared under the direction of the Committee on House Administration by the Office of History & Preservation, U.S. House of Representatives. Washington: Government Printing Office, 2008.